"who presented works of particularly high level and charm for brightness, color taste and the softness of the material, her artworks are even suitable for daily usage". and the prize winning artists. Madeline Prowd "who shows a great technical maturity, presenting very fine works in which the origin from a tradition of a prestigeous school is clear". The works of award-winning artists will be exhibited in the atrium of the Palazzo Loredan, Istituto Veneto, from October 9 to November 7, Monday to Friday from 10.00 to 18.00. Admission is free. The Judging Committee for the award of the Riedel Prize 2014, chaired by Georg J. Riedel, was composed by Rosa Barovier, Sandro Franchini, Chiara Squarcina e Marco Zito. 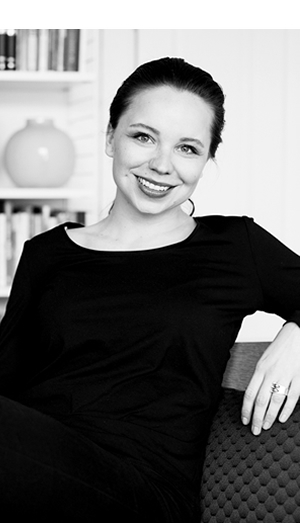 Melvær holds a Masters degree in Industrial Design from the Oslo School of Architecture and Design (2008) and a Masters degree in Visual Communication from the Oslo National Academy of the Arts (2012). Over the past two years Melvær has launched fifteen series of prototypes exhibited in Milan, New York, Los Angeles, Washington DC, Tokyo, Paris, London, Prague, Stockholm, Lillestrøm and Oslo. One of her Ray prototypes was acquired by the VitraHaus exhibition. Melvær was nominated for Young Designer of the Year in Plaza Award 2012 and Nordic Designer of the Year in Nova Design Award 2013. Melvær was awarded Newcomer of the Year and the Soft Bowls were nominated for Accessory of the Year in the Bo Bedre Design Awards 2013. 2006 – 2007: Master of Architecture, Design and Industrial Form, exchange year, The Royal Danish Academy of Fine Arts, School of Architecture.